DVI may be the most confusing video connection standard ever devised. The numerous different types of DVI plug, the different types of signal that can be carried in a DVI cable, and the often frustrating restrictions on run length have led to a lot of questions, and we'll try to clear some of those up here. First, when you're looking for a DVI cable,it's important to be sure you know what type of signal you need to carry. The DVI connection can be used either to carry a digital video signal (DVI-D) or to carry an analogue signal (DVI-A) or both. The only way to be sure what your device accepts or puts out through the DVI connector is to examine the connection point and consult your manual. At right are pictures of a DVI-D plug (digital only) and a DVI-I plug (used for analogue video, with or without digital video alongside). As you can see, the difference between the two lies at the right side; the DVI-D plug has a single, wide flat pin, while the DVI-I plug has that same pin, but also four additional pins, two above and two below it. Those pins are used to carry the red, green, blue and horizontal sync (R,G,B and H) lines of an RGBHV analogue video signal (the vertical sync lies on another pin). If the receptacles on your devices don't have holes which will accept these four pins, then you have a DVI-D connection, which is all digital, no analogue (your plug may also be lacking some other pins; if that's so, you're probably looking at a DVI-D Single-Link plug). If the receptacles do have holes for these pins, then you need to know whether both the digital and the analogue modes are available on the DVI port--check your user's manual. Some devices (at this writing, very few) simply use a DVI-I socket as an equivalent to a VGA socket; these devices do not send or receive digital signals, and the best way to connect them is through an adapter to a VGA cable or to a set of RGBHV cables; see our DVI Analog Connection Options, below. Alternatively, a device with a DVI-I socket may be capable of sending or receiving digital DVI signals through that port, and if the devices on both ends of the cable are both using DVI digital signals, you'll want a DVI-D cable. If the question whether you're dealing with a digital or an analogue connection is confusing you, and you need further guidance on what sort of cable to use, see this article: What Kind of DVI Cable do I Need? We sell quality DVI-D cables in dual link configuration. Whether your application is a single-link or a dual-link DVI connection, a dual-link cable will work (in the case of a single-link connection, it just has some extra pins and wires that won't be connected to anything). 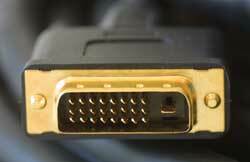 We offer a wide variety of DVI to HDMI cables; these can be found in our DVI to HDMI Department. On this point, a warning: it's not uncommon for people to try to hook analogue devices up to an HDMI connection by chaining adapters and cables; for example, by taking a VGA to DVI adapter and joining it with a DVI to HDMI cable. This simply won't work; everything will plug in just fine, but nothing will function because the signal formats are completely incompatible (and, if you could take an X-ray of the cable and adapters, you'd notice that the analogue signal ultimately doesn't even get connected electrically to the other end of the chain). 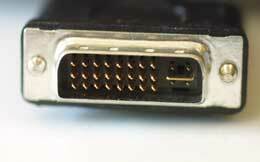 A DVI to HDMI connection will work ONLY to connect DVI-D single-link to HDMI, and not to connect component video, VGA, RGBHV or any other analogue signal type. We also carry several products designed for use with devices that use a DVI port as an input or output for a regular analogue RGBHV signal. Please be sure, before using these, that the DVI socket on your device is a DVI-I socket (that is, that it has sockets for the four analogue pins surrounding the ground pin, as shown above) and that the device is designed to accept or put out an analogue signal through its DVI port. If these conditions are not satisfied, these analogue connections will not work. 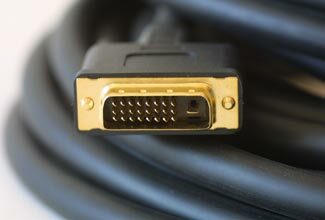 If you're confused about whether you can use an analogue or a digital DVI connection, see the following article: What Kind of DVI Cable do I Need? Our DVI analogue connection options include a small hardshell male DVI/female VGA adapter, DVI to VGA cables, DVI to Male BNC breakout cables, and short (one foot) DVI to Female BNC breakout adapters. For any length over ten feet, we recommend using the DVI to Female BNC breakout adapter, together with a full-sized set of RGBHV cables (available in our RGBHV department). Use of the breakout adapter for long runs will ensure the lowest possible signal loss by avoiding the use of miniature cable over significant distance. Displayport is a new standard which is beginning to appear on computer monitors; we offer a ten-foot Displayport cable and a Displayport-to-HDMI adapter. they are for use only where the DVI port supports analogue signals.